When I think of Vietnamese cuisine, one of the dishes that automatically comes to my mind is of course this classic garlicky morsels wrapped around a stick of sugarcane, Chạo Tôm. 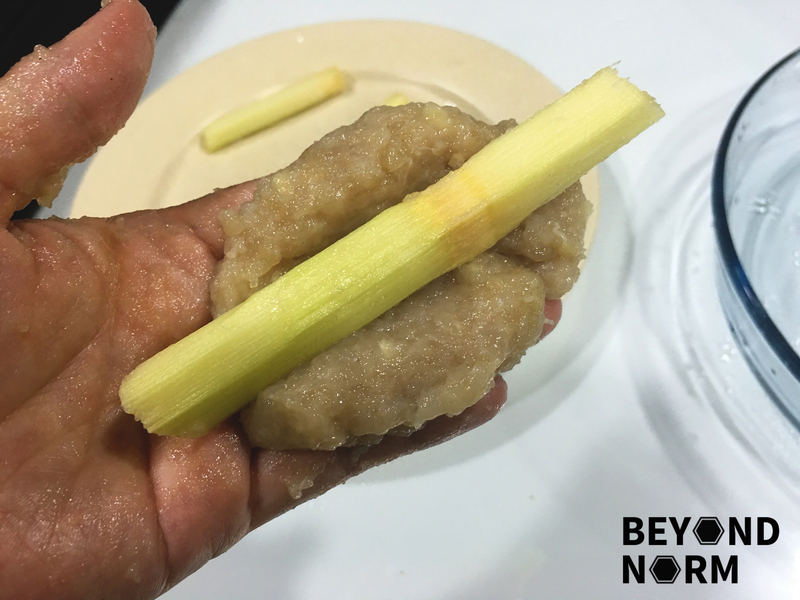 Most of the ingredients are readily available but to get fresh sugar cane is a real challenge. It has never occurred to me that the market near where I lived sells fresh sugar cane until I needed them. What a joy to see them waving to me!! Buy me! Buy me! Hahaha. Chạo tôm is a traditional Vietnamese dish that comes from the Huế region of central Vietnam. It is indeed another popular dish in Vietnam. The way to eat Chạo Tôm is to remove the cooked shrimp paste and wrap it in a small piece of lettuce with fresh herbs and dip them in the sauce. The fun part of this dish is to chew on the sugar cane to get the juice out of it!! If you love Vietnamese food, don’t miss out on all our recipes! Join us via our blog or come by to our Mummy’s Kitchen Facebook Group. You can like us on Beyond Norm’s Facebook Page or subscribe to our blog via the right side bar to get the latest updates. We also love to hear from you so once you have tried this recipe, we hope that you could provide us with some feedback/comments either via our blog. Add lime or lemon juice in increments until you like how it tastes. 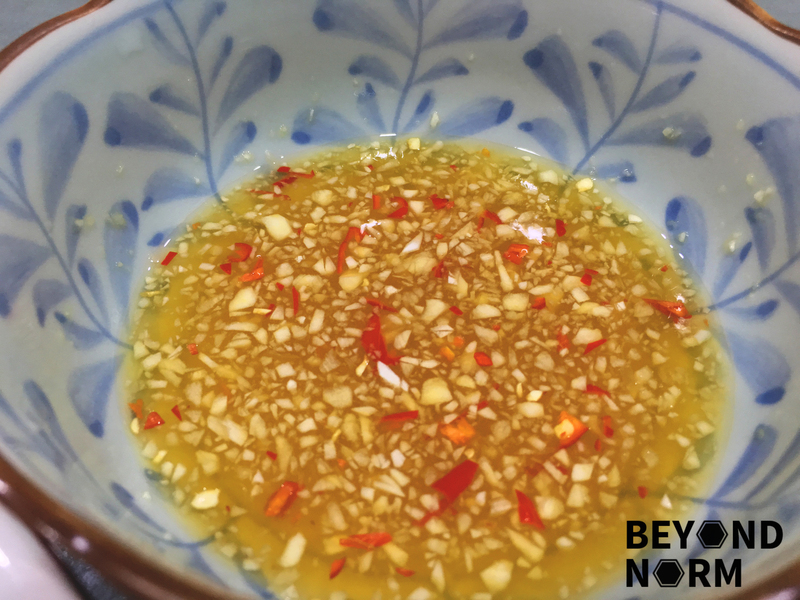 Add fish sauce in increments until you like how it tastes. Top with garlic and chilies. Rinse and devein the shrimp. Put the chopped shrimp, garlic, shallot, pepper, egg and cooking oil into a food processor and blend well to form a smooth paste. Transfer the shrimp paste into a bowl. To increase the stickiness, you can throw the paste into the bowl for as many times as you possibly can. Divide the shrimp paste into 9 to 12 portions, depending on how big and how thick you want it to be. 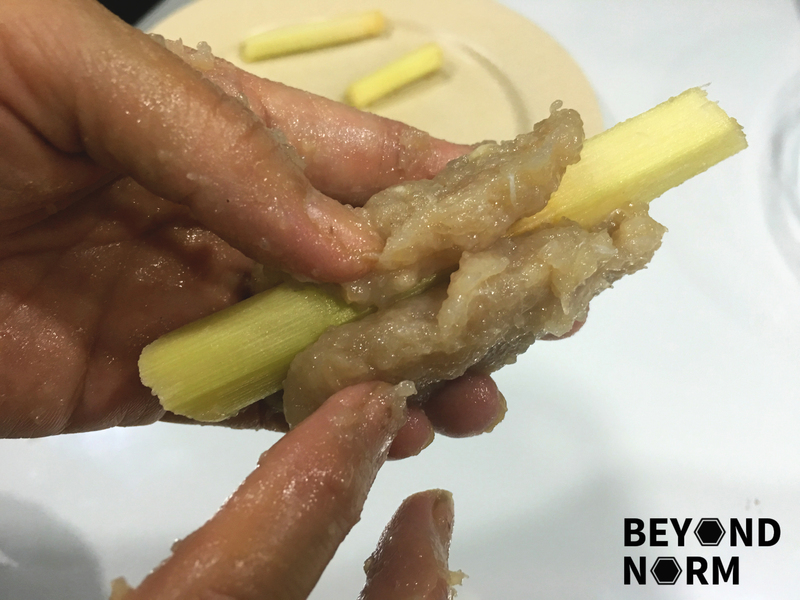 Before wrapping the paste around the sugar cane stick, grease your hands with some cooking oil. Form each divided paste into a ball and then flatten it. Place the sugar cane stick in the middle of the paste. Leave about 1.5 inch of sugar cane exposed. Wrap the paste around the stick and shape them nicely. 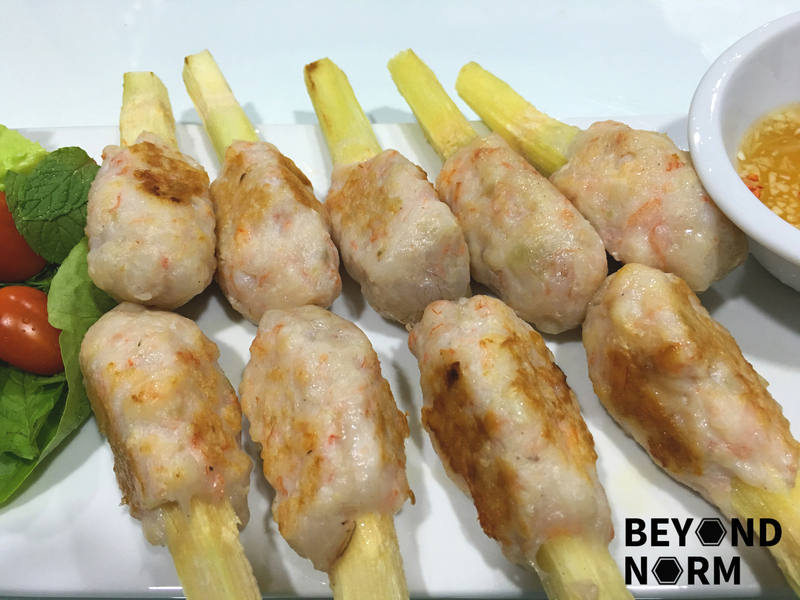 Steam the prawn stick for 3 minutes. Preheat the grill at medium high. Rub each prawn stick with some oil to prevent it from sticking. Grill the shrimp sticks and turn frequently. It is done when the paste is sizzling and there’s some nice browning. 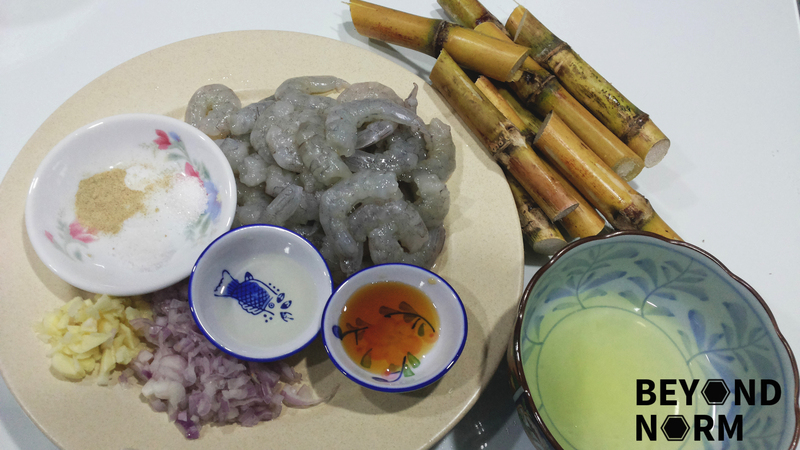 Heat up a wok of oil and deep fry the prawn sticks until golden brown. Heat up a non-stick pan with 2 tablespoons of oil on medium low. Turn frequently to ensure the prawn stick is properly cooked. It is done when the prawn paste has changed colour and some nice browning appears. Serve immediately with the lettuce, herbs, and dipping sauce. Good for a starter. 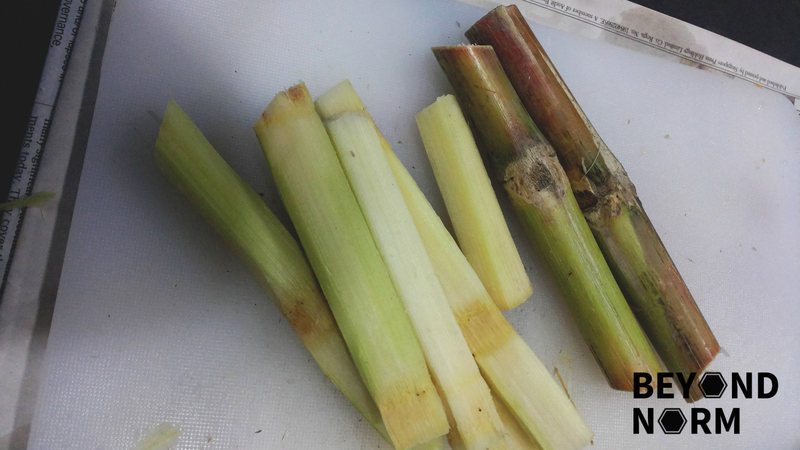 You can replace fresh sugar cane with fresh lemongrass or canned sugarcane if it is available in your area. For those who are allergic to shrimp/prawn, you can replace it with fish. It will not be classified as authentic but not to worry it still tastes really good!! I chose to shallow fry the prawn sticks instead of deep frying.